Pentwater is known for its art galleries, antiques shops and boutiques, so expect some great finds at their summer arts and crafts fairs. 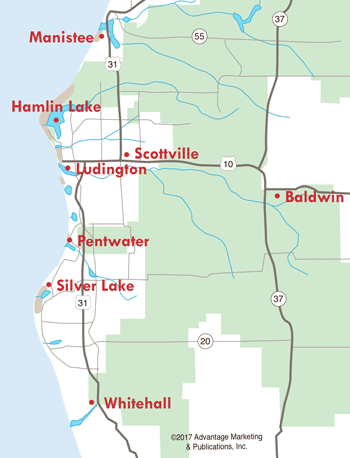 With its beautiful location along Lake Michigan, Pentwater attracts thousands of visitors every summer. Special summer events include Farmer's Markets, Pentwater Civic Band Concerts, July 4th fireworks, and Pentwater Homecoming. From May through September, many of the Pentwater art galleries open their doors for the Last-Saturday-of-the-Month Gallery Stroll held from 5pm-8pm. 15 & 16 - Arts, Crafts and Antiques Fair, Village Green. This two-day event features over 100 vendors. Saturday from 10am-5pm and Sunday from 10am-3pm. Find handmade crafts, one-of-a-kind antiques--even demonstrations of a special skill or art. The festive weekend includes live music on the Green. 13 - Second Saturday in July - Pentwater Junior Women's Club Juried Fine Arts and Crafts Fair, Village Green. This is a one-day, juried, high-traffic arts and crafts fair, which has had an excellent reputation for high quality since 1964. Pentwater Junior Women's Club is a nonprofit group dedicated to promoting civic involvement and supporting the Pentwater community. The Annual Fine Arts and Crafts Fair and Silent Auction are the only fundraising events sponsored by the organization. Funds are distributed to local entities and projects for community improvement, education, arts, and other worthwhile causes. - Ramp Up The Arts show and sale, local artist show and sale from 1pm-4pm, sponsored by Pentwater Arts Council at 215 S. Hancock St., Pentwater. 28 & 29 - Annual Fall Fest Art & Craft Fair, Village Green, sponsored by the Pentwater Chamber of Commerce. 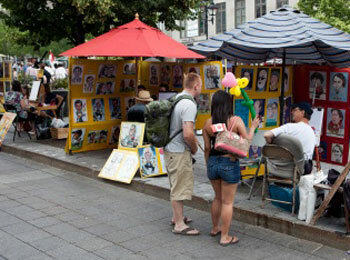 Over 100 vendors provide handmade crafts, antiques, a special skill or art, or a skilled trade. The festive weekend includes live music on the Green. To register for the spring and fall Arts & Crafts Fairs, contact the Pentwater Chamber of Commerce. For the July juried Fine Arts and Crafts Fair, contact the Pentwater Junior Women's Club.